Save SAR 119 (70.41%) – Earn 5 Shukrans What is Shukran? Shukran is the Landmark Group’s award-winning loyalty programme in the Middle East, which allows you to earn Shukrans when you shop any of our brands. Enhance your bedroom decor with this classic duvet cover set, which includes two pillow covers and a duvet. 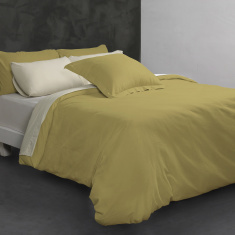 Made from a material that is breathable, this duvet set keeps you cool and comfortable at night. It is perfect for a queen-sized bed.